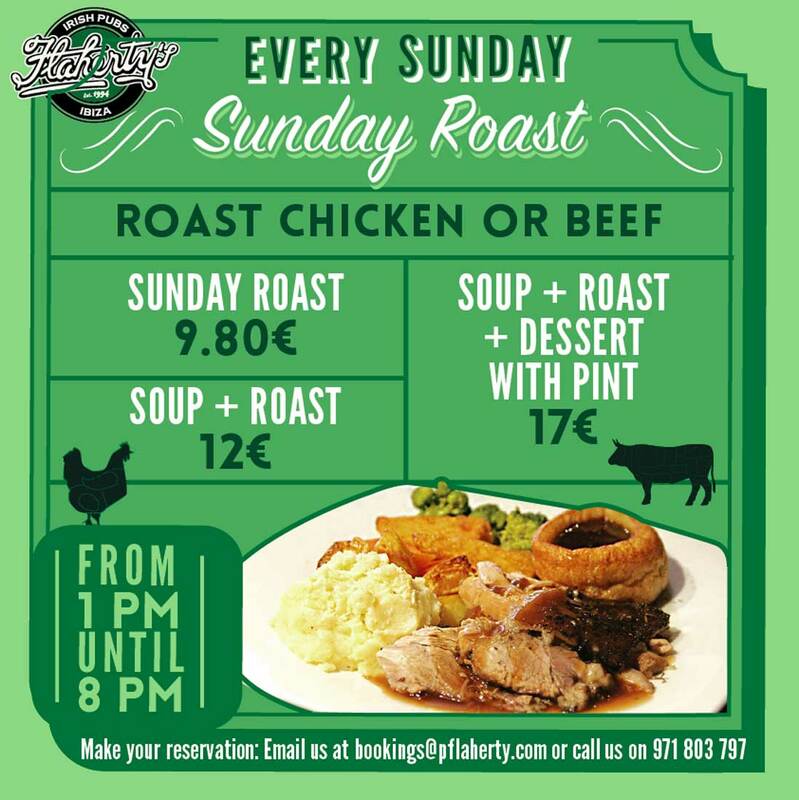 Flaherty’s offer 3 options for Sundays, something to suit every appetite and budget. 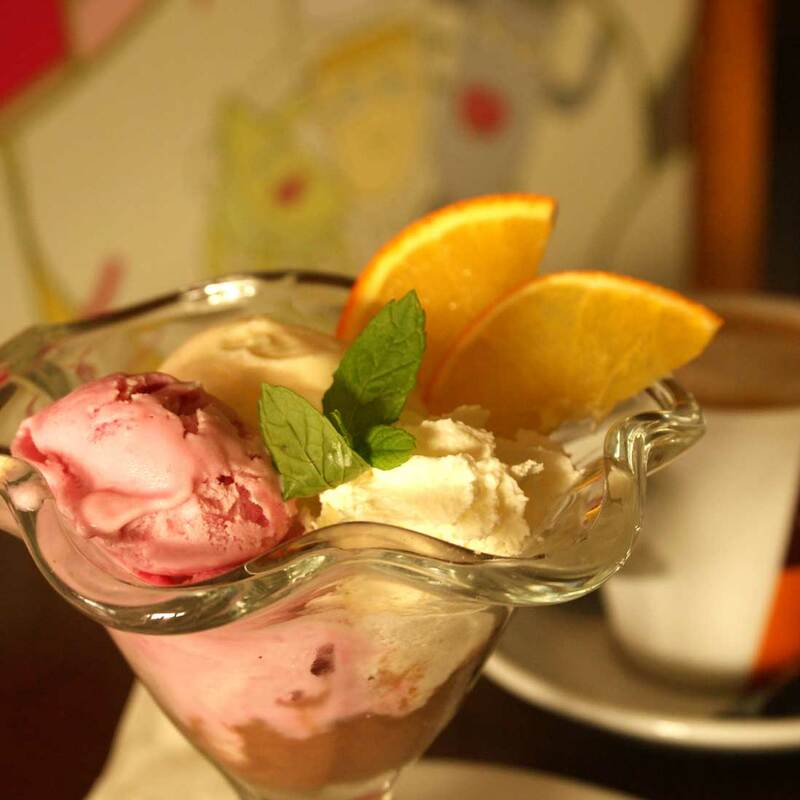 As above they are main course only, 2 course or a great value 3 course that includes a drink. Homemade Tomato soup served with bread and butter. Looks can be deceiving as a straightforward tomato soup this is not. 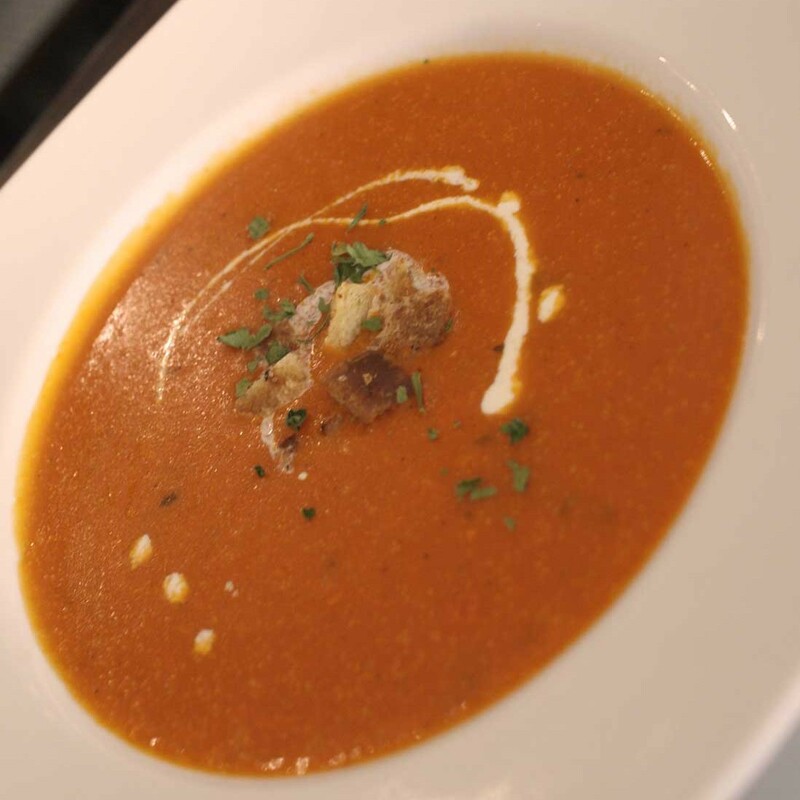 Every mouthful felt warm and satisfying, the rich tomato flavour elevated by the warming seasoning, just what the doctor ordered on a bright but nonetheless chilly Ibizan winter day. A sprinkling of croutons and dash of creme add texture and flair. 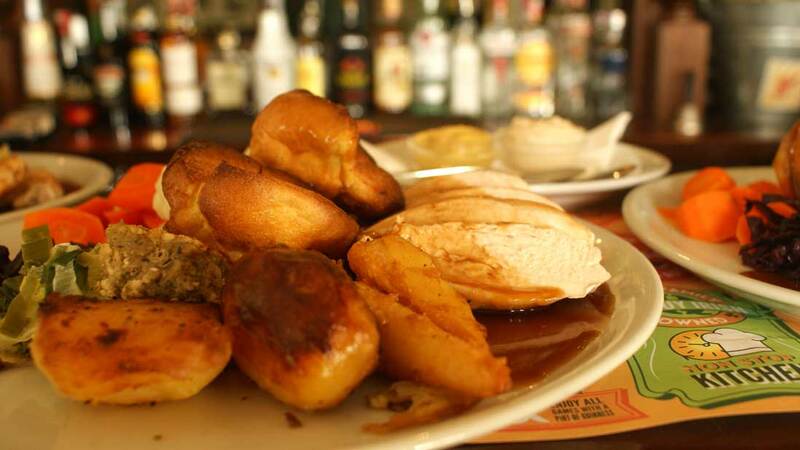 No Sunday should be without a traditional, homemade Sunday Roast. 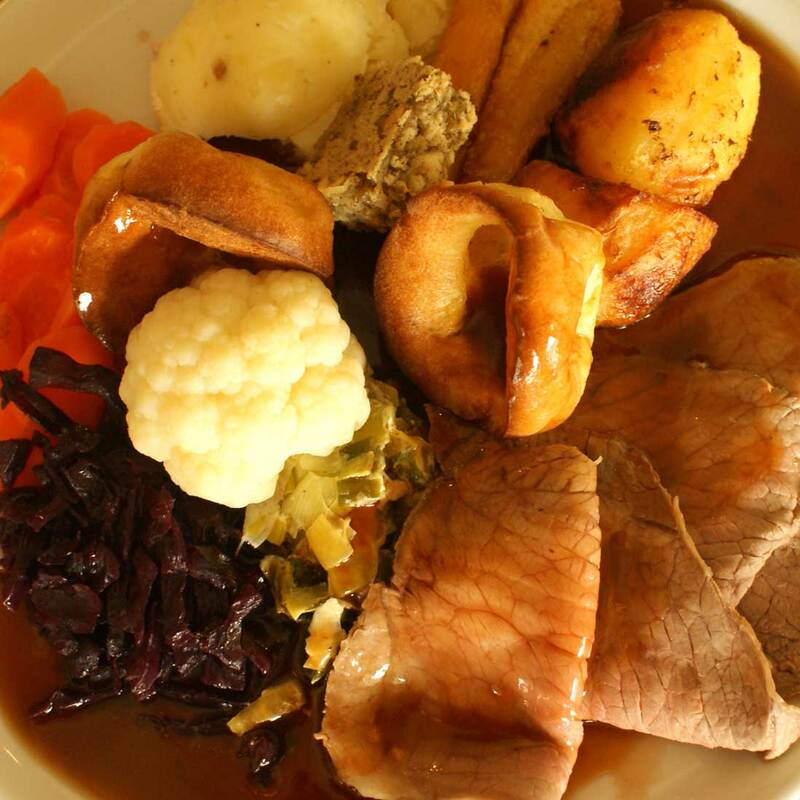 Whether you go it alone or add courses to the Sunday Roast main course, you’ll certainly need a good appetite as each roast is served with creamy mashed potato, roast potatoes, Yorkshire puddings, stuffing, gravy and a selection of vegetables – we had carrots, creamy leeks and red cabbage. The taste was as big as the portion size and everything cooked just right. Yet another taste of home and a prefect dessert to round off the Flaherty’s Sunday Roast experience – the apples were deliciously spiced, the crumble crumbled and the ice cream on the side made the dish. Chocolate Brownie Served warm with cream and ice cream. This brownie was moreish to say the least – even our non-chocolate eating reviewer was seen tucking into this dessert. Vanilla, chocolate and strawberry scoops with the most intense flavours and again not shy in the portion size. 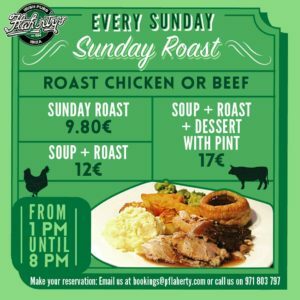 The pleasure in a Sunday Roast lunch at Flaherty’s goes beyond the food itself. We are all for integration and doubt many of our readers would want to spend all their social time at bars and restaurants that have the feel and style of our native lands, but equally there is nothing to apologise for in enjoying the comfort of familiar surroundings sometimes. 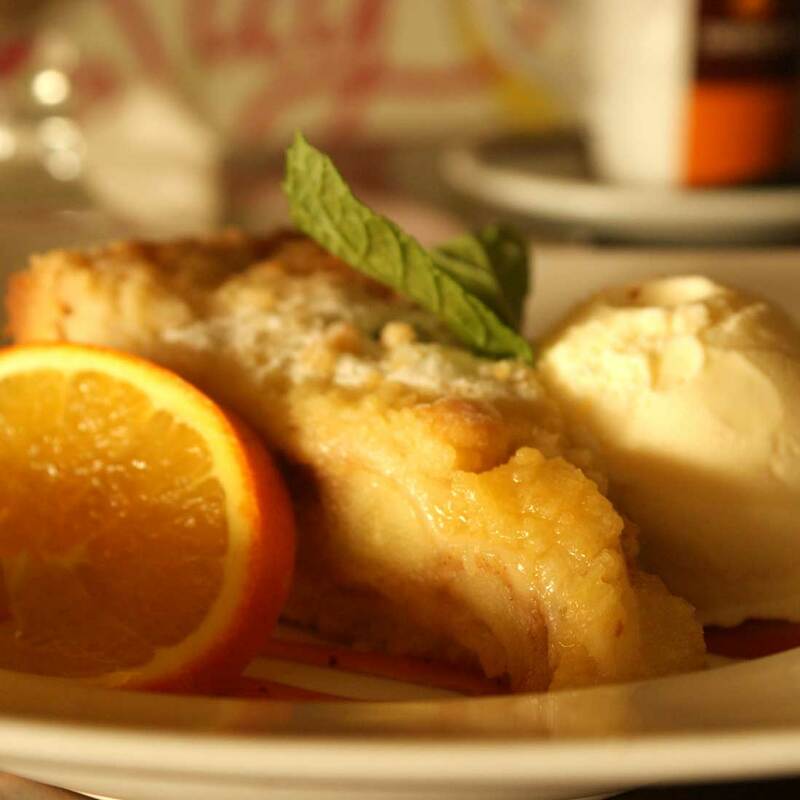 Perhaps a winter Sunday lunch is the best example of when we all enjoy the familiarity of a place like Flaherty’s. Along with your meal you’ll have a warm welcome by friendly local faces, a regular throughput of the local community, and the opportunity to kick back and watch your sporting preference on the many TVs that allow them to cater for most requests most of the time. 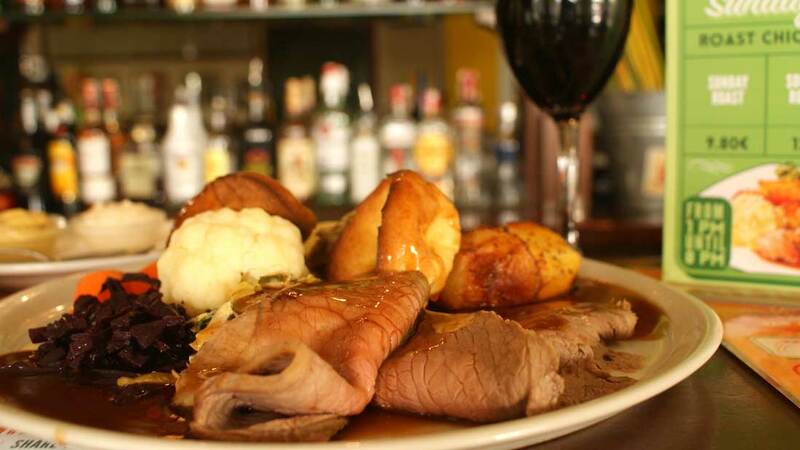 Aside from a short break over Christmas, the Sunday Roast will be available every weekend. 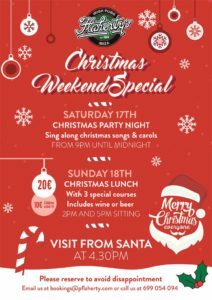 On Sunday December 18th they are waving goodbye to 2016 in fine style with a special Christmas lunch. 20€ Adults, 10€ Children – Booking strongly advisable. 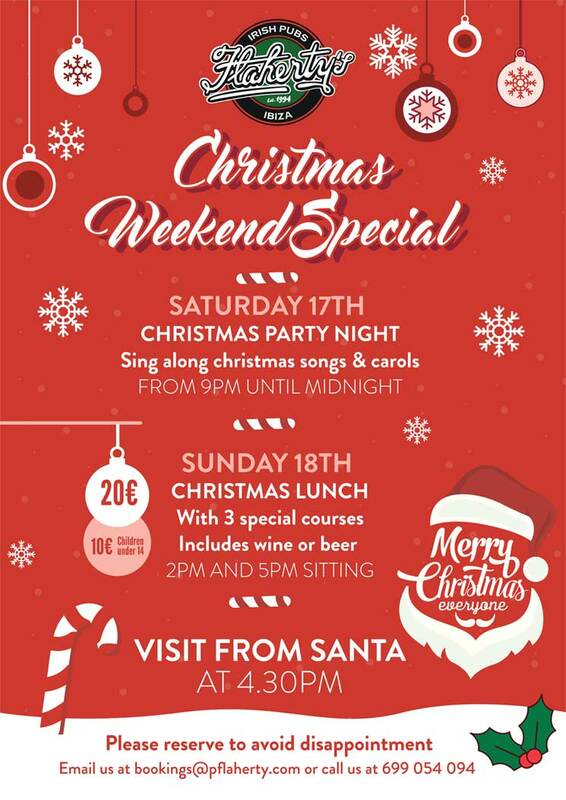 Flaherty’s famed Sunday Roast Lunch is set to get a festive upgrade on Sunday 18th with Champagne on arrival, a 3 course Turkey Lunch with all the trimmings and of course the essential Christmas Cracker for all. There will be 2 sittings, and we love the community style of long table seating. In between the two lunches will be a visit from Santa at 16:30h, with a gift for the children. Your 20€ includes the 3 course dinner, champagne on arrival, plus a further drink included. Though there will be some additional availability on the day, we wouldn’t risk it, booking strongly advised. Next articleEditorial: Christmas Things, Interesting Things, Statistical Things, Newspaper Things & Ibiza Things.